Kenko Tokina Co., Ltd. has recently announced that a prototype of the Tokina FíRIN 20mm F2 FE AF will be on display in the upcoming CP+ Camera & Photo Imaging Show 2018, March 1-4. It’s set to be the second prime lens to join Tokina’s premium “FíRIN” lens series for mirrorless cameras. It will also be the anticipated autofocus version of the current FíRIN 20mm F2 FE super-wide-angle lens for full-frame Sony E-mount cameras. With an optical design based from this manual focus model, photographers will soon be able to choose from both modes according to their needs and shooting style. The selling price for the Tokina FíRIN 20mm F2 FE AF is to be determined later, while the release date is tentatively set for the end of May 2018. Kenko Tokina Co., Ltd. is proud to announce the prototype display of Tokina FíRIN 20mm F2 FE AF at CP+2018 Camera & Photo Imaging show. 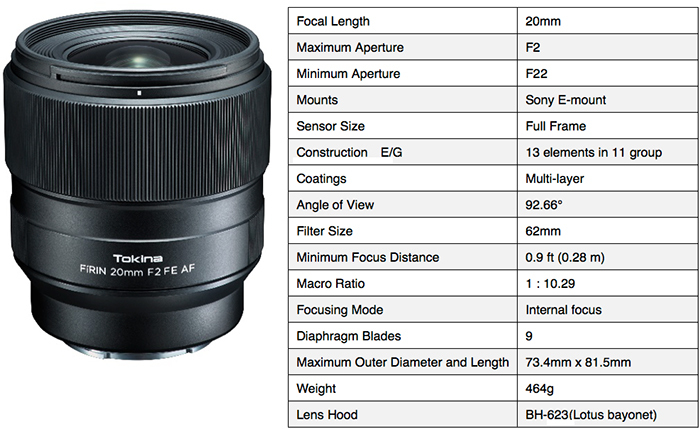 Tokina FíRIN 20mm F2 FE AF is the second prime lens in Tokinaʼs premium lens series “FíRIN” for mirrorless cameras. FíRIN 20mm F2 FE AF is a long-awaited autofocus version of the existing FíRIN 20mm F2 FE super wide angle lens for full-frame Sony E-mount. Adopting the same optical design as in MF model, now we offer two options for end-users to choose according to the purpose and style of shooting.